In April 24 court filings, federal prosecutors in the District of Columbia described four instances in which accused Ponzi schemer Andy Bowdoin was charged during the 1990s with state-level, securities-related crimes in Alabama. Those crimes occurred in Montgomery and Wilcox counties, prosecutors said. But yesterday prosecutors informed Bowdoin’s lawyers and U.S. District Judge Rosemary Collyer that Bowdoin also had been indicted in 1996 in Jefferson County on 12 state-level counts related to securities fraud. The government said it intended to use evidence of Bowdoin’s criminal history in all three Alabama counties in the AdSurfDaily patriarch’s September 2012 trial on ASD-related charges of wire fraud, securities fraud and selling unregistered securities. Warrants were issued in Jefferson County for Bowdoin’s arrest, according to exhibits federal prosecutors produced yesterday in advance of a May 8 bond-review hearing for Bowdoin in Washington. 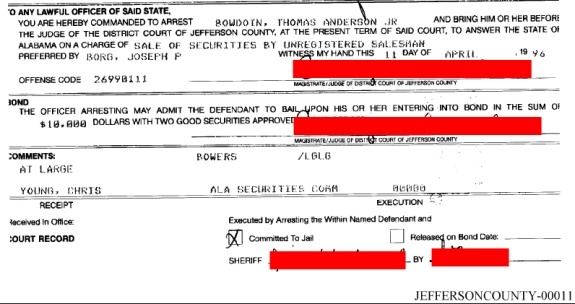 At least one of the records suggests Bowdoin was “Committed To Jail” after his arrest on the Jefferson County charges. How long Bowdoin actually spent in jail was not immediately clear. But records in Alabama show that he entered into plea agreements that required him to testify against at least five alleged securities fraudsters. Federal prosecutors now are suggesting that at least some of the Alabama litigation against Bowdoin was unresolved when he launched ASD in 2006 and that Bowdoin made restitution payments in the state with proceeds from the ASD Ponzi scheme. Bowdoin claims through ASD employees that his only encounter with law enforcement had been a speeding ticket were “false and misleading,” federal prosecutors said yesterday. ASD’s existing members and prospects were not told information that could have helped them in making an informed decision when joining ASD, prosecutors said. In August 2008, the U.S. Secret Service seized tens of millions of dollars from Bowdoin’s bank accounts, amid allegations he was presiding over a massive online Ponzi scheme through ASD. Bowdoin was arrested by the Secret Service in December 2010. Separately, new court filings suggest that Bowdoin’s May 8 bond-review hearing could be delayed, owing to the illness of one of Bowdoin’s lawyers. Prosecutors have said Bowdoin disguised ASD — an illegal securities business — as an “advertising” company. He also is accused of using ASD Ponzi proceeds to make campaign contributions to the National Republican Congressional Committee. Political contributions with Ponzi proceeds? Maybe that explains why there are AUSA’s from the Fraud and Public Corruption Division in the criminal case. Can you explain that one away, Andy? What better excuse than your Lawyer is sick? That ought to buy him at least another month to make plans for his escape. The judge should ask for a note from his doctor…! What I saw in a Florida trial is that lawyers can lie to the court and not be held accountable. One lawyer was late one day for no good reason and his co-counsel said he had no way to contact him because the co-counsel allegedly didn’t own a cell phone (yeah, right – in this day and age). But somehow had one to call someone the next day. I’ll never forget the pitch I got when asked to join ASD (which I did not). I love the term “squeaky clean” don’t you? Guess the State of Alabama didn’t count. Will some of you please start looking at Banners Broker? It’s ringing such a familiar tune to ASD. And they are claiming to be paying out millions! !